The 100 Video Preview and Speculation: Who Tries to Kill Lexa? What happens in the aftermath of Finn's death? The 100 Season 2 Episode 9, "Remember Me," begins to answer that question. 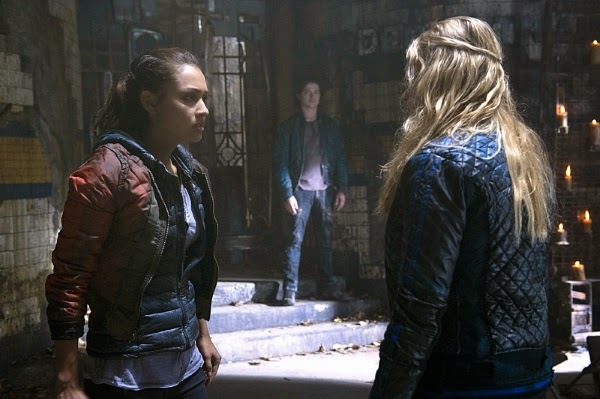 Can the Sky People and the Grounders make peace and form an alliance to fight against the Mountain Men? Clarke's decision to kill Finn to protect him from suffering the pain of 18 deaths will have far-reaching ramifications for her and those around her. Check out the extended video preview for "Remember Me." Lexa was ready to kill Finn for the massacre, yet she warns Clarke that her decision to kill him out of mercy will stay with her forever, "The dead are gone. What you did tonight will haunt you until the end of your days." Not only does Clarke have to live with what she did, she has put the pressure of a truce upon herself as well. She saved Finn from pain, but was that all she did? "If this truce doesn't hold, I killed Finn for nothing," fears Clarke. A peace seems done at the feast as Lexa announces, "Tonight we celebrate our new found peace. Tomorrow we plan our war." That peace doesn't last long when it appears that someone attempted to poison Lexa. Did Raven try to kill Lexa? I don't think so. Though, nice slap there between Raven and Clarke. It will not be easy for Raven to get over Clarke's betrayal. Raven's insult hit the heart, "You're the only murderer here." The question is: Who wants Lexa dead? Did Indra provide the answer, "If she's dead so is the alliance." The Arkers want the alliance to protect themselves and to save their people in Mount Weather. They have no reason to kill Lexa and Raven seems honest in her declaration that it wasn't her. The only one who would come out ahead if Lexa died is .... Indra. Indra has been vocal in her disapproval of Lexa's decisions when it comes to the Sky People. If it's not her, then my guess would be Nyko. He would have access to poison as the Grounders' doctor. He lost his son in the massacre and has good reason to be upset and against the alliance. Who do you think tried to kill Lexa? Will Clarke overcome what she did to Finn? Or will he haunt her forever? And will Raven forgive Clarke ... ever? Watch The 100 Season 2 Episode 9, "Remember Me," on Wednesday, January 21 at 9 pm ET on the CW.